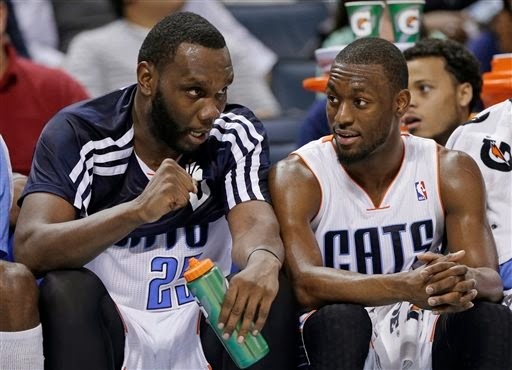 Puddles of Myself: NBA Team of the Week: Are Hornets Better than Bobcats? Did you know that the Charlotte Bobcats have won four games in a row? That ties the Soon to Be Once Again Hornets with the Golden State Warriors for the second longest active winning streak in the NBA. In fact, the Bobcats have won seven out of their last ten games. Kemba Walker was just named Eastern Conference Player of the Week, perennial stat-stuffing (well, traditional stat-stuffing) big man Al Jefferson is having one of his best seasons and the Bobcats are currently jockeying with Washington, Brooklyn, Charlotte and Atlanta in the scrum for the 5-8 seeds in the East playoff picture. Things are looking up in The Queen City! That is, they are looking up for now. You see, Charlotte’s four game win streak has come against hit-or-miss New Orleans, awful Detroit (twice), and Memphis (always tough). And their next four games are at San Antonio (probably a loss), at Oklahoma City (another loss), at Miami (a potential win if Miami treats it like a cruise control game), and home for Indiana (most likely another loss, though Indy has been shaky). That stretch could greatly effect their playoff seeding before they get some relief on March 7 when, over the course of a week, they play the dysfunctional Cleveland Cavaliers at home, followed by a game at Memphis, Denver (imploding) at home, at up and down Washington, and then hosting the unpredictable Timberwolves at home. The good news is that no matter how Charlotte fares over the next three weeks, they are most likely going finish as the seventh or eighth seed barring some crazy collapse or a miraculous rally by Cleveland (possible) or Detroit (not likely). Chances are that, when April rolls around, the Bobcats will have the opportunity to be swept by either Miami or Indiana in the first round of the playoffs, which would be the franchise’s first postseason appearance since 2010. Now, I’ve always been a little sentimental when it comes to the Bobcats. I’m a big Michael Kidd-Gilchrist fan. I’m a sucker for his “heart” and “competitive spirit.” Even though he’s been injured this year and most of his numbers are down, his shooting has slightly improved (46 FG%, 51% TS%) and his defense remains an asset—the team is allowing 2.5 more points when Kidd-Gilchrist is off the court. Hell, I’m even in the Jeff Taylor Fan Club and he’s also been injured and may not even be any good. But what do we make of the Bobcats now? Their improved defense has already been discussed; and so has the upgrade at coach that Steve Clifford has provided. The Bobcats are currently 5th in points allowed giving up 96.8 points per game, which puts them ahead of Miami, Oklahoma City and San Antonio. As the default “big man anchor,” Jefferson is allowing opponents to shoot 54% at the rim, which isn’t elite, but, as reported elsewhere, his pick and roll defense has vastly improved, which has made him far less of a liability on the defensive end than in years past. Since the Bobcats are likely to make the playoffs and get swept, what is the next step? Well, right now they have a solid starter and borderline (OK, OK, bear with me) All-Star point guard in Kemba Walker. Walker is only twenty-three and has improved every year in the league. This year he is averaging 18.4 points, 5.5 assists, 4.4 rebounds and shooting 41%-34%-81%. Those aren’t true All-Star numbers, but compare those averages to what 2014 All-Star and fan favorite Damian Lilliard is averaging (21.2 PPG, 5.8 APG, 43-40-88) and you’re not far off. Could Kemba Walker be a starter on a solid playoff team? Absolutely. Meanwhile, Al Jefferson is locked into a three year deal worth 41 million dollars that is certainly an overpay, but not necessarily a disaster since Big Al is twenty-nine and will most likely only begin his decline in the last year of the deal. If Jefferson can continue giving the Bobcats/Hornets 20 PPG, 10.4 RPG and a 22 PER with improving defense in a solid team system for the next two years, the Bobcats will have two solid pieces to fill in around. And they already have a few promising pieces. If Gilchrist can model himself into a more athletic Tony Allen, then Charlotte will have the tenacious wing defender any contender needs. The team picked up Gary Neal from Milwaukee to provide floor spacing for the postseason run, but they’ll need to figure out a way to turn Gerald Henderson, Josh McRoberts and even my beloved Jeff Taylor into better floor spacing shooters, which will not be easy. Bismack Biyombo has shown improvement this year (8.0 PPG and 12 RPG) as a shot-blocking, athletic center, but he still skews towards closer to not being an overachieving backup than he does to being an adequate starter. And the team still doesn’t know what they are going to get from rookie Cody Zeller going forward. But this summer, the Bobcats will most likely have two first round picks. Neither one will be at the top of the promising (but slightly losing luster) 2014 Draft, but they could use one of the picks paired with a player salary to try and acquire a proven shooter and third scoring option. Gerald Henderson would look much better as a sixth man than as a starting shooting guard. Or, they could take a chance on a mid first round and late first round pick and see what happens. Draft picks are best as unused assets, but developing rookies can still work to tip the scale on an offseason or midseason deal. The Bobcats were a flash in the pan playoff team in 2010 and their history of mismanagement and ineptitude is well documented. But it looks like they have a stable coach in place with a modern, defensive minded philosophy that the team has bought into. They have enough young players and future assets that they can turn this probable playoff year in the atrocious Eastern Conference into perhaps something more long-lasting. Or they could mess it up. It is Charlotte after all.